Looking for a great gift for grandparents? 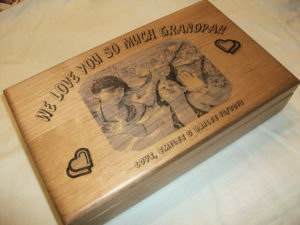 These personalized keepsake boxes with your photo and text beautifully laser engraved make a perfect personalized gift for grandpa, gift for grandma or Mothers Day, Fathers Day, graduations or special occasions. This Alder wood box features solid wood construction and a foam-lined interior bottom to keep precious mementos safe. This box laser engraves a dark brown tone for excellent contrast. Create that one-of-a-kind gift for a loved one, or that special creation just for you. Memories can last a lifetime with a custom made laser engraved keepsake box featuring your picture and text of your choosing. Great surprise gift idea for everyone from Grandpa’s to kids! 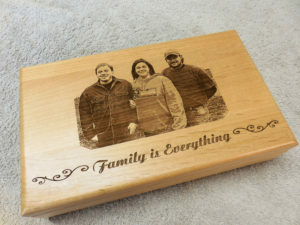 Laser engraved high quality and beautiful to display Alder wood box measures approx. 11″ long x 6 1/2″ wide x 2 1/2″ deep. They hold 5″x7″ pictures, letters, or any sort of small keepsakes you want. Supply me with your photo and desired text. Once your picture and text have been decided on, I will send you a layout for approval. Once everything has been approved, allow 3-5 business days for me to create your box. View keepsake boxes at my Etsy Shop!